I know the post card looks a little dark, but I really liked the tones it brought out when its this dark. I tried a lighter color..but it just didnt look as good. The various stamps are brushes. 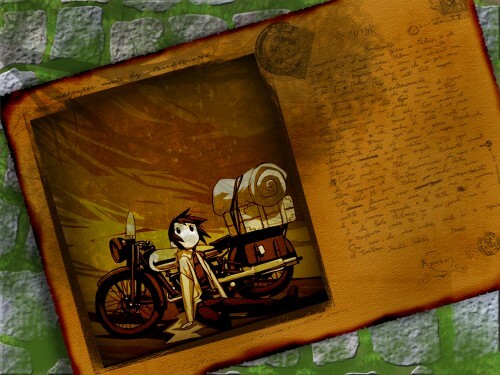 and that writing on the top of the post card (in japanese) says Kino no Tabi/Kino's travels. So I made mine cobblestone! I thought it would be nice. for some reason, kino's travels makes me think of cobblestone. At first I was going to use a stock photo, but it looked real bad so I made everything you see in the background by hand. (thats a good reason why it looks so crappy). oh, I also used cobblestone because if I used wood it wouldnt have looked good with the postcard being all brown anyways. hmm...what else. The tree shadow is a brush. Originally, it was a bare tree..and then I realized that there wouldnt be bare trees when there is new green moss on the ground (well, if you think a little logically anyways) So I added some leaves. I dont know if you can see them though, because the tree shadow kind of blends in with the postcard. i also used some kind of technique with the "photo" part to make it look a little more vintage. i cant remember what its called, but it looks really really nice if you use it on regular images. i like the concept. the old coloring of the postcard and seemingly burnt edges look quite nice. teehee. kawaii starrliteangel! It really looks old, lucky it wasn't torn yet. ^^ hmm.. what's the green and white bg behind it? table surface? ground surface? nice use of the effects. and you did it real fast! I like it very much! Well, the background, not so much. I think the postcard would have had more "oomf" if it was against a lighter background? Kino no Tabi really suits it well. Nice idea. The burned edges and the faded writing makes it look like it went through a lot.